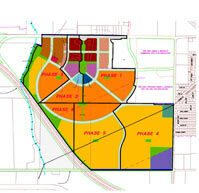 EMC Planning Group prepared an EIR for an Area Plan for a 493.3-acre site including general plan land use and circulation diagram amendments and the annexation of 401.1 acres to the City of Los Banos. Proposed land uses included office campus, mixed use (first floor retail and second floor office or residential), commercial, parks, trails, environmental reserve, fire station, elementary school, church, child day care, and several forms of residential housing including multi–family, and single family detached with lots from 4,500 to 10,000 square feet. Roads and utilities would be developed within the project site, and a three-mile sewer line extension, half-mile storm drain line, and 10-acre storm drainage basin would be developed off-site. The project site was within an airport zone in which the school, day care and senior housing components were not permitted. The city was considering relocating the airport (independent of the Area Plan); however, an alternate land use plan was included in case the airport remained. Other major environmental issues addressed included biological resources (site is adjacent to a creek), air quality, public services, traffic and circulation, and water supply.